Lots of Superhero Movies: The Green Hornet came out in the US on January 12 and Thor, Green Lantern, and Captain America: The First Avenger are scheduled for release in May, June, and July respectively. Hopefully all of them will go well, and chances are at least one will be good. The Last Harry Potter Film: Deathly Hallows Part One was possibly my favorite Harry Potter adaptation yet, and I am looking forward to Part Two knocking my socks off. Not One, But Two New Zahn Books: Cobra Guardian, sequel to Cobra Alliance, and Star Wars: Choices of One, sequel to Allegiance are both set for release this year. As I may have mentioned before, I'm a big fan of Timothy Zahn's books, both Star Wars and non, so I am happy. 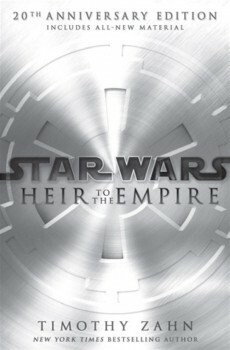 Heir to the Empire Strikes Back: Speaking of amazing books by Timothy Zahn, the twentieth anniversary re-release of Star Wars: Heir to the Empire comes out this June, with new cover art (at least for the jacket...), annotations and a new short story. More Full Metal Panic! Novel Translations: I love giant robots and I love humor, so naturally one of my favorite anime series is Full Metal Panic!, based on the novels by Shoji Gatoh. After nearly three years, Tokyopop is finally translating the Ending Day By Day, the fourth Full Metal Panic novel. This is the book that FMP's third anime season, The Second Raid, is based on. Say what you will about Tokyopop's novel translations, I'll be happy to have this book available to read in English. The Disappearance of Haruhi Suzumiya: The anime film based on the fourth book in Nagaru Tanigawa's Haruhi Suzumiya series is set for a US release this spring. I really enjoyed the book and the anime series, so the movie should be fun to see. Television Continues Being Fun: While Syfy has canceled SGU, the shows Warehouse 13, Sanctuary, and Eureka have all been renewed for their third, fourth, and fifth seasons, respectively. Also, the psychic detective comedy Psych has been renewed for a sixth season, so I'll have a lot of TV to veg-out on, despite the sad lack of Stargate. Veteran's Day/ Remembrance Day: November 11, 2011. AKA: 11/11/11 How can you not love that? So, those are a few things I'm happily awaiting this year. Happy slightly-early Year of the Rabbit, and may you have plenty of good things to look forward to!